The growth in consumer wearables over the last few years has been well documented. The commonality of devices such as the Fitbit, Jawbone, Apple Watch and Misfit Shine - to measure personal parameters such as heart rate, steps taken in a given day and even stress levels - have given us an unprecedented insight into our current condition and a potential heads-up on any imminent health issues. It’s not just humans that are benefiting from the explosion in wearable technology however, as there are now many devices that have been designed to improve the lifestyle of our four legged friends. Last year, figures from the Pet Food Manufacturers’ Association (PFMA) showed that there are currently 8.5 million dogs in the UK and 7.4 million cats. Pet ownership is on the rise, as is the amount of money we spend on them. Recent figures from Grand View Research has revealed that the global pet wearables market is expected to reach $2.36bn by 2022. And, in many ways, the pet wearables sector has the potential to play an even more vital function for animals than our own wearable devices do for us – but in order to realise that potential, optimum performance is essential. Unlike us, pets of course, have no way of communicating to us exactly how they are feeling, so wearable technology has the capability of opening a window into their world to give us vital information of an animal’s mood, physical condition or whereabouts. However, because of that lack of communication between us and our pets, it is vital that any information provided by wearables is as accurate as possible to avoid feeding us (and vets) erroneous data – which could prove costly when it’s the sole form of feedback from the individual animal. In addition, while us humans may have an attitude of ‘handle with care’ when it comes to our gleaming new FitBit or SmartWatch, a pet clearly has no understanding that they potentially have an expensive and delicate piece of technology hanging around their neck – and as a result won’t treat it as such. Therefore, any wearable devices for the pet market must be robust enough to put up with the daily demands of your average household pooch – which could of course involve some rough and tumble, a trot through muddy puddles and a dip in the local stream! Pet devices range from GPS trackers to smart dog collars, and there are an increasing number of companies that are developing wearable gadgets solely for animals. 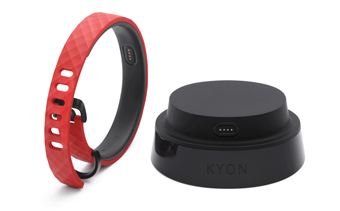 Among some of the devices currently available include the Kyon Pet Tracker (right) which features a water sensor that can detect if a dog is in danger of drowning, and an accelerometer and altimeter which can be used to warn you if your pet is unusually sedated - a sign of potential health problems. The Inupathy wearable (pictured top) includes a heart rate monitor that fits like a harness and flashes different colours and light patterns to indicate the dog’s mood - happy, excited, anxious etc. Company CEO Joji Yamaguchi claims the device is more precise and tells you more information than a wagging tail ever could. Along with a GPS tracker the DogTelligent device enables owners to speak to their dog from anywhere thanks to built-in micro-speakers, and includes LEDs that light up at night and will automatically flash if the dog is lost. Makers of the device also claim that it has the longest rechargeable battery life of any smart dog collar with the same selection of features. For the feline lovers, the Pod 2 claims to be the world’s smallest and lightest GPS tracker and activity monitor and has a ‘Locate Now Button’ to display a cat’s location on a map. Owners also have the ability to set-up a virtual fence where you can receive an alert when the animal goes beyond a given boundary. Suitable for both species, another device called PetPace (below) tracks vitals such as temperature, pulse, respiration, activity, calories and posture, notifying you of any abnormalities - the data can also be accessed by your vet. Activated when motion is detected, the PawsCam generates six second videos of the animal’s activities which can then be accessed via an iOS device or on the web. The shock-proof device has a seven day battery life on a single charge, and it shoots 480p 30fps videos, which go directly to the cloud via WiFi. If the device can’t find a connection, the videos are stored in its internal memory. Many of these devices were given their first outing at the Consumer Electronics Show (CES) 2016 in Las Vegas back in January. One of which, the PitPat, I was able to get my hands on for a trial on my own French bulldog, Stanley. First of all the app and monitor is very easy to set-up. 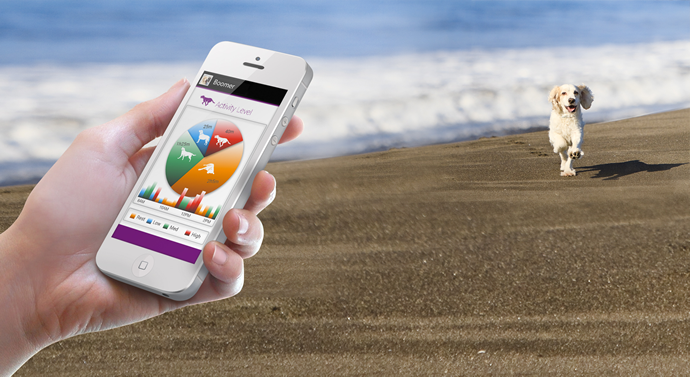 Simply download the app, hit the button on the lightweight monitor around the dog’s collar and you’re ready to go. The monitor keeps a check on your pooch’s activity – which can be downloaded via Bluetooth to your smartphone – and is broken down into periods of resting, walking, playing and running. Based on this information, and that of the specifics of the individual animal (age, weight, bread etc), the app can then assess whether your dog is getting enough exercise. Secondly, what was also quickly apparent is that the monitor is suitably robust. By testing the device predominantly during a typical British winter, the PitPat had to put up with its fair share of inclement weather conditions – without any signs of deterioration in performance. In addition, the French bulldog is not the most agile and dexterous of dog breads and in Stanley’s case, when he’s chasing his ball at full throttle, his stopping distances are juggernaut-esque! As a result, he’s developed a rather novel way of coming to a halt as quickly as possible - dropping to his side and performing what can only be described as a doggy-forward roll, flipping him round 180 degrees - this means the PitPat gets some pretty rough treatment on the average walk, but again, without any noticeable defects. In the time we’ve been using the PitPat we’ve had an interesting insight into his activity and the exercise he’s getting. And, because it details the time and duration of dog walks, the monitor can also serve as a useful tool to keep tabs on those teenagers who are more than a little liberal with the truth when asked if they’ve taken the dog for a walk! Here to stay, or a flash in the pan?